Given its recent history, Cambodia could be one of the saddest places on earth. But as Samantha Kodila journeys across the country, visiting ancient temples, bustling cities, floating villages and heartbreaking memorials, she discovers a nation imbued with hope. The sun sinks towards the horizon, accentuating each crevice of the fairy floss clouds floating over a distant mountain. The air is heavy with humidity and a layer of stickiness coats my skin as though I’ve been rolling in honey. The only relief is a gentle breeze through the windows of our small wooden boat as it cruises through Tonle Sap’s lapping waves. To the right, clouds eclipse the blue sky, turning it a shady grey. For the moment it looks far away, and I remain unconcerned, turning back to the view. “It’s about to rain!” shouts Chantal, our group leader and, as if on cue, water droplets burst from the sky, slapping into the boat’s frame. The calm lake now heaves beneath us and everyone stumbles in the confined space as we gather our belongings from the rain-soaked floor – there is no glass in any of the windows – and place them on seats. Tonle Sap is the largest freshwater lake in Cambodia, and our group of 10 is trying to cross it. We’re traversing it and the Sangker River from Battambang to Siem Reap, a common journey for both locals and travellers. Depending on weather conditions, the trip can take anywhere between nine and 12 hours. Out here, it feels as if we’re a world away from the bustle of the city. Setting sail from Battambang, colourful markets and tooting tuk-tuks disappear from view, and an oasis awaits. Palm trees edge the river and stilt houses balance precariously over water. Men and women cast fishing nets, children bathe by the river’s edge and women hang out freshly washed clothes, smiling and waving as we pass. It’s hard to believe how friendly the people are when the country was so recently brought to its knees. From 1975 to 1979, the Cambodian people suffered through what would be later named the Killing Fields era. Led by Khmer Rouge dictator Pol Pot, the prospering country was transformed into a land of horror. Almost overnight the regime stripped thousands of people of their personal belongings, evacuated the cities and forced the population to work in the fields. Intellectuals – doctors, lawyers, teachers – were tortured then slaughtered, as were ethnic and religious minorities and people connected to the previous government. In four years, an estimated two million people – about 20 per cent of the country’s population – died. We’d confronted this bleak history outside Battambang two days earlier. Our guide, Borem, walked with us through Wat Samrong Knong and the killing caves at Phnom Sampeau, and spoke quietly of the atrocities that had occurred. Borem was just six years old when the Khmer Rouge was removed from power, but he did not escape the brutality. “They would come to the schools and ask, ‘Who wants to meet the King?’ My brother wanted to meet the King, so he gets on the truck. But it’s not really to meet the King.” He pauses. “On the way to Phnom Penh, they stop halfway, they help them move to a rice eld. Then they kill them.” His brother was 16 years old, and just one of thousands of students lured to his death. During the regime, Wat Samrong Knong was seized by the Khmer Rouge and turned into a prison. More than 10,000 people were executed in the field behind the temple. Now, in the same open space, the Well of Shadows memorial is filled with the bones of those killed. Even in the heat I shiver as I examine the stone carvings around its base depicting the atrocities that occurred. In Phnom Sampeau, we ride to the top of a rocky outcrop by motorcycle, and Borem shows us a hole that opens up into a gaping cavern. Here, people were thrown to their deaths. A golden Buddha lies on its side in a corner, as if asleep. Our journey back to Battambang is a solemn one. Locals heading off to work as the sun rises over Kompong Khleang. Along the Sangker River, however, smiles abound. More than 80,000 people live on or over the water and there is an almost constant hum of activity. Fishermen pose for photographs and children pull faces and blow kisses. We smell fish before we see the locals scouring scales from their flesh, and get up close to crocodiles farmed for their skin. Men and women cast fishing nets, children bathe by the river’s edge and women hang out freshly washed clothes, smiling and waving as we pass. As we edge into our ninth hour on the water, everyone is restless, hungry and exhausted. We shuffle around to avoid the incoming rain and I remind myself that just 48 hours earlier we were standing on soil where thousands had lost their lives. I am humbled and grateful for this momentary discomfort. Chan Taen, a Cambodian aid worker, who is accompanying us to our homestay in Kompong Khleang. This floating village, the largest community on the fringes of Tonle Sap, is an hour outside of Siem Reap. Our host, Promhong, greets us at the top of a towering set of wooden stairs. Her English is limited, but her eyes are kind. Shyly, I mumble sus sdiy – hello in Khmer – and receive a smile in return. The open-plan stilt house is larger than I expected, although Chan informs us the village only received electricity last year. A large wooden table has already been set with white bowls, hand-carved silver cutlery and bottled water. We sit down to dinner – fish, vegetables, soup and rice – and everyone falls upon their food with barely disguised enthusiasm. Once we come up for air, Chan tells us about his work with Neary Khmer (it means Khmer women), an NGO that teaches those in disadvantaged communities about everything from nutrition, cooking and basic hygiene to agriculture, governance and micro-finance. As conversation winds down, we bid Chan and Promhong goodnight and head for bed. Beneath a mosquito net, I close my eyes, the only sound the swishing of the fan overhead. At 4.30am that all changes. Chan had warned us the day starts early around here, but what I can hear isn’t loud – it’s deafening. I roll over, half asleep and disorientated, unsure if I’m dreaming there’s a motorbike – or is it a helicopter? – rumbling just outside the room. The daily grind on the river has begun and it feels as though the waterway traffic is in the room with us. With sleep now impossible I sneak out of bed. For the next couple of hours, perched on the steps leading down to the river, I observe the village coming to life. Narrow boats cruise past, some carrying mothers and their children, others holding lone men in loose shirts and flapping hats catapulting across the water to work. After breakfast we meet with some of the most impoverished women in the village. Chantal has brought tools for shredding plastic water bottles into tape that can then be crafted into items for sale. Chan translates as Chantal explains how to use the tools, and our group assists where we can. The women chatter as Chantal shows them pictures of bracelets and necklaces, brooms and mats, all of which they can create with the tape. When one woman manages to shred her bottle correctly, her face lights up and the ladies around her clap excitedly, returning to their own bottles with renewed enthusiasm. I ask what they’ll make with their new tools. “A broom – for the spiders,” says one, gesturing to the ceiling, her smile wistful. 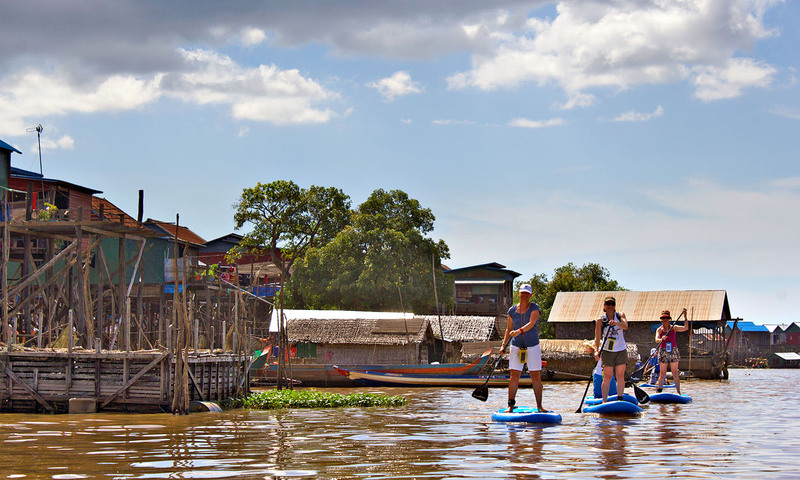 Stand-up paddleboarding near the stilt houses of Kompong Khleang. During lunch we decide the conditions for paddleboarding – one of the reasons we’re on this SUP Wilderness Adventure tour – are too perfect not to take advantage of, and set out along the river. People stand on their balconies watching us with interest as we glide by, and children point and giggle. The sun’s rays penetrate my skin, and it feels as though my blood is bubbling just below the surface, like cheese under a griller. The urge to roll into the river is almost overpowering, but I can’t. Apart from the risk of being hit by a passing boat, the river also acts as a public bath and toilet. No one drinks the water. After a quick change, we wander through the village to the school, laden with supplies. One by one, we gift the pencils and books to the children. Each bows his or her head in appreciation, before they collectively sing a rendition of Cambodia’s national anthem. The sky is still purple when we arrive, but a pink tinge begins to bloom across it like a splash of tie-dye. As the sun rises, the silhouette of Angkor Wat emerges. Under the cover of darkness, tuk-tuks and vans form a processional line as they head out of Siem Reap towards Angkor Archaeological Park. Our guide, Chen, collects us at 5am, chortling good-naturedly at our sleepiness. In western countries people queue up at ungodly hours to buy the newest Air Jordans or the latest Apple gadget – here, swarms of travellers surround a small building forming orderly queues beneath blue and white signs. There’s a low hum of excitement as they wait to purchase tickets for one of the wonders of the ancient world. A magical sunrise at Angkor Wat (the 4am wake-up is worth it). The sky is still purple when we arrive, but a pink tinge begins to bloom across it like a splash of tie-dye. As the sun rises, the silhouette of Angkor Wat emerges. There’s no other way to describe the scene: it is beautiful. We join the hordes of people wandering into the ancient temple, and Chen draws our attention to carvings, statues and the architecture. Construction began between 1113 and 1115, and I’m amazed to discover it took 37 years to build. After a tasty breakfast, we clamber onto bikes and head towards Bayon and Ta Prohm, our journey from temple to temple accompanied by the siren song of cicadas, their one unbroken vibrato note reminding me of a singing bowl. The afternoon is filled with zip-lining through the trees of Angkor Archaeological Park, and the next day involves a traditional cooking class. But I can’t stop thinking about the sunrise over Angkor Wat, and decide to return on my own. As I sit by the water’s edge, the star-speckled sky making its slow transformation, the reflection of the ancient temple appears before me, a mirror image save for a ripple here and there. Still standing after centuries, through changing governments, war and genocide, Angkor Wat is a symbol of the Cambodian people – strong, resilient, humble. AirAsia flies to Siem Reap via Kuala Lumpur from Sydney, Melbourne, Gold Coast and Perth. Settle in to Cambodia in style at the luxurious Sanctuary Villa in Battambang. There’s a pool, spacious villas, free wi-fi and complimentary buffet breakfast, all only a five-minute tuk-tuk ride from the city centre. Double rooms cost about US$75 a night. Homestays at Kompong Khleang can be organised through a local company called Buffalo Trails. Prices start at about US$125 a person per night (twin share), and include transport, meals, a cooking lesson and guide. In Siem Reap the compact, modern rooms at Secrets Pavilion Urban Boutique Hotel offer cool showers and air-conditioning. The hotel is located in the night market area and is only a five-minute walk from the city centre. Double rooms start at about US$32 a night. Avoid the tuk-tuk queues and go on a more personalised adventure around Cambodia’s ancient temples. Grasshopper Adventures’ Angkor Sunrise Discovery tour includes a guided walk through Angkor Wat followed by breakfast, cycling through Angkor Archaeological Park to Bayon, Ta Prohm and the Elephant Terrace temples, and lunch at Sra Srang Lake. The full-day tour costs about US$85, excluding a temple pass (the guide will assist with its purchase at the park entrance). For those keen on fun and giving back in a tropical environment, SUP Wilderness Adventures has a range of tours to destinations including Vanuatu, Solomon Islands, Tahiti, Palau and Laos. The trips combine expedition-style small group adventures with community projects. Most adventures cost less than US$1540 (excluding flights).